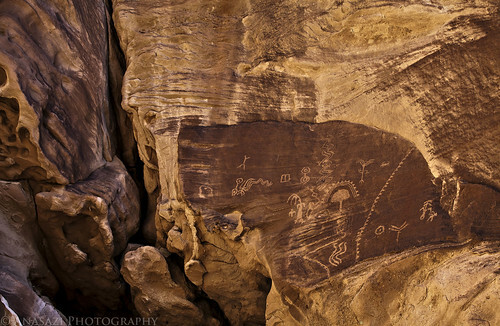 This is a very interesting Fremont petroglyph panel hidden in the San Rafael Swell that many people drive by, but most don’t notice. The centerpiece of this panel appears to be a very life-like tree, which is something I don’t think I have come across anywhere else, yet. I really like how this photo shows the full petroglyph panel pecked into the patch of desert patina tucked up in a crack of the sandstone wall. What a truly fascinating setting!